The final seconds tick down during the third period of the hockey tournament’s final game. The score is 6-5 and the trailing team is pushing for an equalizer. The players rush around the offensive zone, swarming the net for a deflection, a rebound. There’s a sense of desperation on the ice, but unlike most games, none of the players know exactly how much time is left. No player can see the clock. 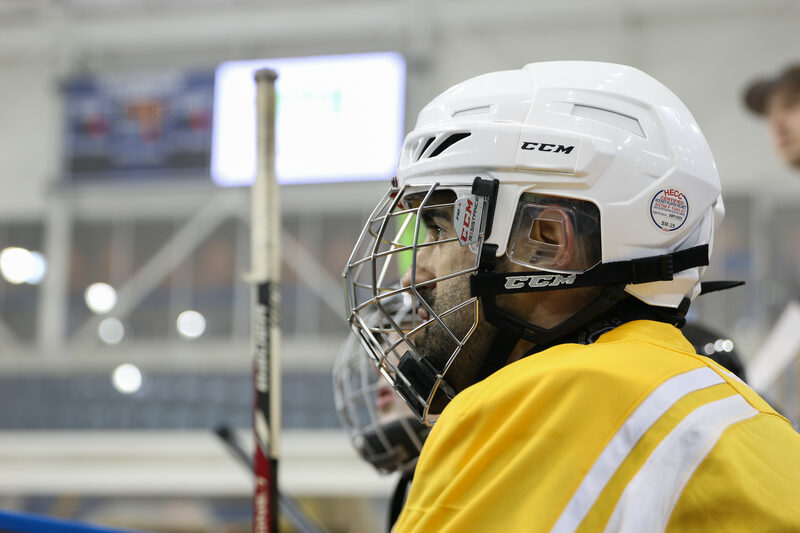 This is the fifth year Ryerson’s Mattamy Athletic Centre (MAC) has hosted the Canadian Blind Hockey Tournament, the biggest national showcase for blind hockey in the country. 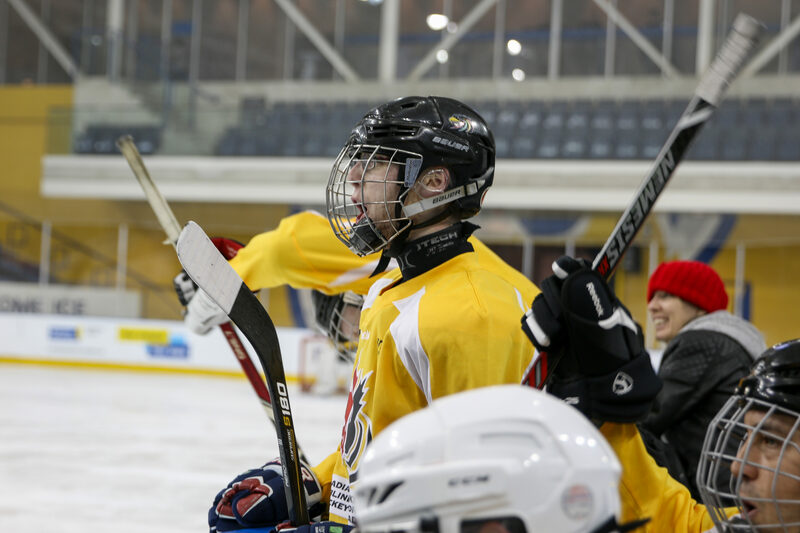 Players have travelled from across Canada to participate in the six-team competition, where organizers divide players in terms of their physical ability and level of blindness. The rosters range from teenagers to 70-year-olds and from partial to full blindness. Blind hockey is understandably quite different from NHL hockey. The puck is the most noticeable difference. It’s about 10 centimetres in diameter, hollowed out and filled with hardware. It clanks loudly as it’s passed around the ice, allowing the players to hear it and follow it by ear. Typically, forwards will have better eyesight than defenders and, by rule, all goalies are fully blind (if not naturally, then playing with a blindfold). Meanwhile, Dow watches the final game in a front-row seat. His white cane is folded neatly on his lap and he follows the game on his phone’s camera, zooming in on the action. He can’t fully take in the game like most of the crowd, but that doesn’t impede his enjoyment of the it. “Great finish,” said Dow, as he stood up following the final buzzer. Dow got involved with the sport eight years ago through a friend and has participated in all five blind hockey tournaments. He’s happy to admit he’s not terribly athletic, but said blind hockey is not about trophies and scoring titles, but rather teamwork, support and engagement. “It’s inspiring to see people that were down or having issues with depression … just come out and get a sense of something that’s normal,” said Dow. But it’s still a sport that garners little attention. Awareness is a concern for St. Denis, who advocates as much as he can to draw young people to the sport. He’s concerned that not enough children with vision disabilities know of blind hockey and how playing could affect their lives.